“APEC” redirects here. For the recent APEC meeting, see APEC Papua New Guinea 2018. For other uses, see APEC (disambiguation). An annual APEC Economic Leaders’ Meeting is attended by the heads of government of all APEC members except Republic of China (which is represented by a ministerial-level official under the name Taiwan as economic leader). The location of the meeting rotates annually among the member economies, and a famous tradition, followed for most (but not all) summits, involves the attending leaders dressing in a national costume of the host country. APEC has three official observers: the Association of Southeast Asian Nations Secretariat, the Pacific Economic Cooperation Council and the Pacific Islands Forum Secretariat. APEC’s Host Economy of the Year is considered to be invited in the first place for geographical representation to attend G20 meetings following G20 guidelines. APEC currently has 21 members. However, the criterion for membership is that the member is a separate economy, rather than a state. As a result, APEC uses the term member economies rather than member countries to refer to its members. One result of this criterion is that membership of the forum includes Taiwan (officially the Republic of China, participating under the name “Chinese Taipei”) alongside People’s Republic of China (see Cross-Strait relations), as well as Hong Kong, which entered APEC as a British colony but it is now a Special Administrative Region of the People’s Republic of China. APEC also includes three official observers: ASEAN, the Pacific Islands Forum and the Pacific Economic Cooperation Council. Bangladesh, Pakistan, Sri Lanka, Macau, Mongolia, Laos, Cambodia, Costa Rica, Colombia, Panama, and Ecuador, are among a dozen other economies that have applied for membership in APEC. Colombia applied for APEC’s membership as early as in 1995, but its bid was halted as the organisation stopped accepting new members from 1993 to 1996, and the moratorium was further prolonged to 2007 due to the 1997 Asian Financial Crisis. Guam has also been actively seeking a separate membership, citing the example of Hong Kong, but the request is opposed by the United States, which currently represents Guam. APEC has long been at the forefront of reform efforts in the area of business facilitation. Between 2002 and 2006 the costs of business transactions across the region was reduced by 6%, thanks to the APEC Trade Facilitation Action Plan (TFAPI). Between 2007 and 2010, APEC hopes to achieve an additional 5% reduction in business transaction costs. To this end, a new Trade Facilitation Action Plan has been endorsed. According to a 2008 research brief published by the World Bank as part of its Trade Costs and Facilitation Project, increasing transparency in the region’s trading system is critical if APEC is to meet its Bogor Goal targets. The APEC Business Travel Card, a travel document for visa-free business travel within the region is one of the concrete measures to facilitate business. In May 2010 Russia joined the scheme, thus completing the circle. APEC first formally started discussing the concept of a Free Trade Area of the Asia-Pacific (FTAAP) at its summit in 2006 in Hanoi. However, the proposal for such an area has been around since at least 1966 and Japanese economist [ja]‘s proposal for a Pacific Free Trade agreement proposal. While it gained little traction, the idea led to the formation of Pacific Trade and Development Conference and then the Pacific Economic Cooperation Council in 1980 and then APEC in 1989. At the 2014 APEC summit in Beijing, APEC leaders agreed to launch “a collective strategic study” on the FTAAP and instruct officials to undertake the study, consult stakeholders and report the result by the end of 2016. APEC Executive Director Alan Bollard revealed in the Elite Talk show that FTAAP will be APEC’s big goal out into the future. Each economy nominates up to three members from the private sector to ABAC. These business leaders represent a wide range of industry sectors. ABAC provides an annual report to APEC Economic Leaders containing recommendations to improve the business and investment environment in the Asia-Pacific region, and outlining business views about priority regional issues. ABAC is also the only non-governmental organisation that is on the official agenda of the APEC Economic Leader’s Meeting. Since its formation in 1989, APEC has held annual meetings with representatives from all member economies. The first four annual meetings were attended by ministerial-level officials. Beginning in 1993, the annual meetings are named APEC Economic Leaders’ Meetings and are attended by the heads of government from all member economies except Taiwan, which is represented by a ministerial-level official. The annual Leaders’ Meetings are not called summits. At the 2001 Leaders’ Meeting in Shanghai, APEC leaders pushed for a new round of trade negotiations and support for a program of trade capacity-building assistance, leading to the launch of the Doha Development Agenda a few weeks later. The meeting also endorsed the Shanghai Accord proposed by the United States, emphasising the implementation of open markets, structural reform, and capacity building. As part of the accord, the meeting committed to develop and implement APEC transparency standards, reduce trade transaction costs in the Asia-Pacific region by 5 percent over 5 years, and pursue trade liberalisation policies relating to information technology goods and services. In 2003, Jemaah Islamiah leader Riduan Isamuddin had planned to attack the APEC Leaders Meeting to be held in Bangkok in October. He was captured in the city of Ayutthaya, Thailand by Thai police on 11 August 2003, before he could finish planning the attack. Chile became the first South American nation to host the Leaders’ Meeting in 2004. The agenda of that year was focused on terrorism and commerce, small and medium enterprise development, and contemplation of free agreements and regional trade agreements. The 2005 Leaders’ Meeting was held in Busan, South Korea. The meeting focused on the Doha round of World Trade Organization (WTO) negotiations, leading up to the WTO Ministerial Conference of 2005 held in Hong Kong in December. Weeks earlier, trade negotiations in Paris were held between several WTO members, including the United States and the European Union, centred on reducing agricultural trade barriers. APEC leaders at the summit urged the European Union to agree to reducing farm subsidies. In a continuation of the climate information sharing initiative established by APEC Climate Network working group, it was decided by the leaders to install the APEC Climate Center in Busan. Peaceful protests against APEC were staged in Busan, but the meeting schedule was not affected. At the Leaders’ Meeting held on 19 November 2006 in Hanoi, APEC leaders called for a new start to global free-trade negotiations while condemning terrorism and other threats to security. APEC also criticised North Korea for conducting a nuclear test and a missile test launch that year, urging the country to take “concrete and effective” steps toward nuclear disarmament. Concerns about nuclear proliferation in the region was discussed in addition to economic topics. The United States and Russia signed an agreement as part of Russia’s bid to join the World Trade Organization. 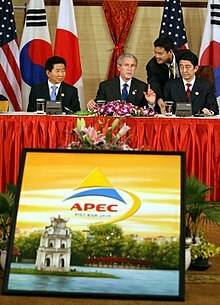 The APEC Australia 2007 Leaders’ Meeting was held in Sydney from 2–9 September 2007. The political leaders agreed to an “aspirational goal” of a 25% reduction of energy intensity correlative with economic development. Extreme security measures including airborne sharpshooters and extensive steel-and-concrete barricades were deployed against anticipated protesters and potential terrorists. However, protest activities were peaceful and the security envelope was penetrated with ease by a spoof diplomatic motorcade manned by members of the Australian television program The Chaser, one of whom was dressed to resemble the Al-Qaeda leader Osama bin Laden. The APEC USA 2011 Leaders’ Meeting was held on Honolulu, Hawaii 8–13 November 2011. At the end of the APEC Economic Leaders’ Meeting the leaders gather for the official APEC Leaders’ Family Photo. A tradition has the leaders dressing to reflect the culture of the host member. The tradition dates to the first such meeting in 1993 when then-U.S. President Bill Clinton insisted on informal attire and gave the leaders leather bomber jackets. At the 2010 meeting Japan had the leaders dress in smart casual rather than the traditional kimono. Similarly, when Honolulu was selected in 2009 as the site for the 2011 APEC meeting, U.S. President Barack Obama joked that he looked forward to seeing the leaders dressed in “flowered shirts and grass skirts”. After viewing previous photos, and concerned that having the leaders dress in aloha shirts might give the wrong impression during a period of economic austerity, Obama instead decided it might be time to end the tradition. Leaders were given a specially designed aloha shirt as a gift but were not expected to wear it for the photo. Leaders in Bali, Indonesia at the 2013 conference wore a batik outfit; in China 2014 Tang suit jackets; in Peru 2016 vicuna wool shawls; in 2017 Vietnamese silk shirts. APEC has been criticised for promoting free trade agreements that would impose restrictions on national and local laws, which regulate and ensure labour rights, environmental protection and safe and affordable access to medicine. According to the organisation, it is “the premier forum for facilitating economic growth, cooperation, trade and investment in the Asia-Pacific region” established to “further enhance economic growth and prosperity for the region and to strengthen the Asia-Pacific community”. The effectiveness and fairness of its role has been questioned, especially from the viewpoints of European countries that cannot take part in APEC and Pacific Island nations that cannot participate but stand to be affected by its decisions. ^ a b Due to the complexities of the relations between it and the People’s Republic of China, the Republic of China (ROC or “Taiwan“) is not represented under its official name “Republic of China” or as “Taiwan”. Instead, it participates in APEC under the name “Chinese Taipei“. The President of the Republic of China cannot attend the annual APEC Economic Leaders’ Meeting in person. Instead, it is generally represented by a ministerial-level official responsible for economic affairs or someone designated by the president. See List of Chinese Taipei Representatives to APEC. ^ APEC. “Member Economies”. Asia-Pacific Economic Cooperation. Retrieved 24 September 2016. ^ “PECC – Back to Canberra: Founding APEC”. pecc.org. Retrieved 12 November 2017. ^ “Achievements and Benefits”. apec.org. ^ “How Could The 2016 APEC Forum Affect The World Economy? – FXCM”. FXCM Insights. 9 January 2017. ^ Parreñas, Julius Caesar (January 1998). “ASEAN and Asia‐Pacific economic cooperation”. The Pacific Review. 11 (2): 233–248. doi:10.1080/09512749808719255. ^ “Asia-Pacific Economic Cooperation -“. apec.org. Retrieved 12 November 2017. ^ Government of Canada, Foreign Affairs Trade and Development Canada. “Canada and the G20”. GAC. Retrieved 12 November 2017. ^ “Deputy PM meets US State Secretary on G20 meeting sidelines – Embassy of the Socialist Republic of Vietnam in the United States”. vietnamembassy-usa.org. Retrieved 12 November 2017. ^ 5 Minutes 10 Minutes (12 January 2007). “APEC ‘too busy’ for free trade deal, says Canberra”. Theaustralian.news.com.au. Retrieved 4 November 2011. ^ “Media Statement by the President of India upon the conclusion of his state visit to Papua New Guinea and New Zealand en route from Auckland to New Delhi”. pib.nic.in. Retrieved 8 October 2016. ^ “AFP: West worried India would tip APEC power balance: official”. Agence France-Presse. 6 September 2007. Archived from the original on 5 November 2011. Retrieved 4 November 2011. ^ Lee, Matthew (20 July 2011). “Clinton urges India to expand influence”. Associated Press. Archived from the original on 24 February 2015. ^ a b c d e f “MACAU DAILY TIMES – No negotiations on APEC membership”. 21 February 2013. Archived from the original on 21 February 2013. Retrieved 12 November 2017. ^ Bhandari, Neena. “India Voice – India will have to wait for APEC membership”. india-voice.com. Retrieved 12 November 2017. ^ a b c Leff, Alex (22 June 2011). “Costa Rica Inches Toward Coveted APEC Membership”. Americas Quarterly. Retrieved 22 June 2011. ^ “Peru, Colombia seek closer Central America, APEC trade ties –”. Dominicantoday.com. 29 August 2006. Archived from the original on 14 October 2007. Retrieved 4 November 2011. ^ english@peopledaily.com.cn (8 October 2004). “People’s Daily Online – Ecuador seeks APEC accession in 2007”. People’s Daily. Retrieved 4 November 2011. ^ “People’s Daily Online – Colombia seeks APEC membership in 2007: FM”. People’s Daily. 6 September 2006. Retrieved 4 November 2011. ^ “Transparency Reform Could Raise Trade by $148 Billion in APEC” Archived 30 May 2008 at the Wayback Machine John S. Wilson & Benjamin Taylor; Trade Facilitation Reform Research Brief, The World Bank. 2008. ^ “Russia joins the APEC Business Travel Card Scheme”. apec.org. Sapporo. 29 May 2010. Retrieved 5 August 2015. ^ Bergsten, C. Fred, “Toward a Free Trade Area of the Asia Pacific”, Peterson Institute for International Economics Number Pb07-2. Pdf can be found via Google. Retrieved 9 November 2014. ^ “China-led RCEP trade talks to begin in May”, thebricspost.com, 25 April 2013. Retrieved 10 November 2014. ^ “China’s President Xi touts ‘Asia-Pacific dream’ ahead of APEC summit”, Deutsche Welle, 9 November 2014. Retrieved 9 November 2014. ^ Goodman, Lee-Anne, “Harper, Obama attend Asia-Pacific trade deal meeting in Beijing”, The Canadian Press, 10 November 2014. Retrieved 10 November 2014. ^ a b c d September 2007 – (13 September 2011). “FTAAP”. Brookings.edu. Archived from the original on 20 September 2011. Retrieved 4 November 2011. ^ a b “Plan B for World Trade”. Petersoninstitute.org. Retrieved 4 November 2011. No reference to numbers of FTAs. ^ “Australian APEC Study Centre”. Apec.org.au. Archived from the original on 26 October 2011. Retrieved 4 November 2011. ^ “Berkeley APEC Study Center”. Basc.berkeley.edu. Retrieved 4 November 2011. ^ “Chinese Taipei APEC Study Center”. Ctasc.org.tw. Retrieved 4 November 2011. ^ “HKU APEC Study Center”. Hku.hk. Archived from the original on 11 August 2011. Retrieved 4 November 2011. ^ “Kobe University APEC Study Center”. Rieb.kobe-u.ac.jp. Retrieved 4 November 2011. ^ “The Canadian APEC Study Centre, The Asia Pacific Foundation of Canada”. Asiapacific.ca. Archived from the original on 2 October 2011. Retrieved 4 November 2011. ^ “ASC UI”. ASC UI. Archived from the original on 1 October 2011. Retrieved 4 November 2011. ^ Online, Abac. “Home – APEC Business Advisory Council”. www2.abaconline.org. Retrieved 12 November 2017. ^ “National Center for APEC – About ABAC”. ncapec.org. Retrieved 12 November 2017. ^ “APEC Business Advisory Council (ABAC) – China APEC Development Council”. chinaapec.org. Retrieved 12 November 2017. ^ Wallace, Bruce (21 September 1998). “APEC Protest Controversy”. Maclean’s via The Canadian Encyclopedia. Historica Foundation of Canada. Archived from the original on 30 September 2007. Retrieved 6 September 2006. ^ Nuttall-Smith, Chris (27 November 1997). “APEC summit gets nasty at UBC”. Varsity News. Sarah Galashan. Varsity Publications, Inc. Archived from the original on 13 October 2006. Retrieved 6 September 2006. ^ Schmidt, Sarah (6 January 1998). “Student protesters fight back for civil rights”. Varsity News. Varsity Publications, Inc. Archived from the original on 13 October 2006. Retrieved 6 September 2006. ^ “Civil rights group denounces attack on UBC students’ APEC protests” (Press release). British Columbia Civil Liberties Association (BCCLA). 23 November 1997. Archived from the original on 5 October 2006. Retrieved 6 September 2006. ^ “Student member of BCCLA executive arrested!” (Press release). British Columbia Civil Liberties Association (BCCLA). 25 November 1997. Archived from the original on 5 October 2006. Retrieved 6 September 2006. ^ “Apec supports nuclear, agrees climate targets”. World Nuclear News. 10 September 2007. Archived from the original on 4 October 2007. Retrieved 15 September 2007. ^ “Apec Honolulu Schedule”. 9 November 2011. Archived from the original on 13 October 2012. Retrieved 9 November 2011. ^ “No kimonos for APEC leaders in Japan”. Reuters. 11 November 2010. Archived from the original on 15 November 2010. Retrieved 12 November 2010. ^ “No aloha for Hawaiian shirts at APEC family photo”. Honolulu Star-Advertiser. 13 November 2011. Retrieved 13 November 2011. ^ “Awkward Apec Fashion: what the world leaders wore”. The Guardian. 8 November 2018. Retrieved 10 November 2018. ^ Gerhardt, Tina (11 November 2011). “America’s Pacific Century? : APEC Summit in Hawaii Seeks to Implement Free Trade Agreement of the Asia Pacific Region”. Commondreams. ^ “APEC—a pretty empty chatter”. The Economist. 12 September 2007. Fazzone, Patrick B. (2012). “The Trans-Pacific Partnership—Towards a Free Trade Agreement of Asia Pacific?”. Georgetown Journal of International Law. 43 (3): 695–743. ISSN 1550-5200. Alkan, Abdulkadir (2014). “APEC 2014: Better diplomatic ties for better economic relations”. Daily Sabah.